Dutch researchers drilling into the glaciers of Greenland have discovered that climate change occurs more rapidly than previously believed - indeed, the most recent ice age ended abruptly in just one year. The NordGrip drilling project in Greenland has extracted ice cores from the ancient ice sheets there which reveal that the world's most recent ice age ended precisely 11,711 years ago. 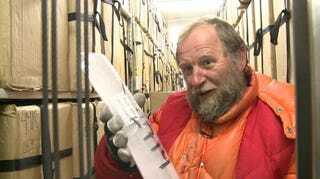 An ice core is a long cylinder drilled out of the ice, made up of layers of snow and ice that have fallen in the region for millennia. By examining the amount of snowfall buried in those layers, researchers at the Niels Bohr Institute in Copenhagen have determined the exact year the ice age halted and gave way to our current climate. Our new, extremely detailed data from the examination of the ice cores shows that in the transition from the ice age to our current warm, interglacial period the climate shift is so sudden that it is as if a button was pressed. This discovery suggests that our current climate could undergo a similar rapid change, shifting back into ice age mode in just one year. Anthropologist John Hawks comments that the idea of extremely rapid climate change has gained a lot of currency in the past decade. But no, it does not mean that ice ages start Day After Tomorrow style, with climate changes chasing people down hallways. Photo via Niels Bohr Institute.